During the summer holiday, I was by chance able to visit the clinic of a senior of the alumni. The clinic is special because it’s a veterinary clinic of Chinese medicine which provides treatment aiding to ease the various discomforts in the course of the recovery of illnesses. The senior introduced the equipment and facilities in his clinic and meticulously explained their usage, for example, the electric needles. It’s an acupunctural treatment with additional current stimulation to enhance the effect of the treatment. 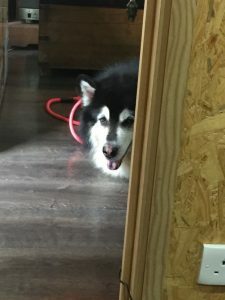 Unfortunately I wasn’t able to witness such an acupunctural treatment on this visit, but took the picture of a big sled dog which was there for a follow up appointment as a commemorate. I was happy for the opportunity to expose myself to different types of treatment which opened up my horizons. I remember my teaching telling us to get more contacts at this stage with various new things rather than binding ourselves in one particular area. Because of the summer job, I did not visit or intern in any veterinary clinics. But I was still in contact with animals in life as the Eublepharis macularius we kept at home has mysteriously gone missing. 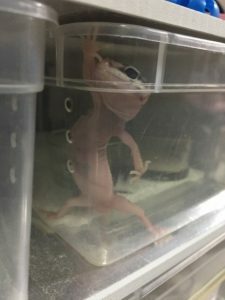 It was finally found after much difficulty, when I carefully observed its health condition I noticed that it has established a way of escape and kept trying to get out of its container. 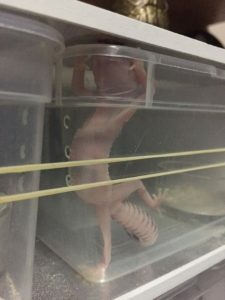 We finally decided to add a rubber band on the outside of the container (see picture below) to prevent it from escaping again. Like the previous summer holidays, I went to work as a vet assistant in an animal clinic. Since I knew that I am going to study pharmacology in the coming semester, I paid more attention to the use of different drugs. I learnt that pharmacology is much more complicated than I expected. I have to understand how the drugs are absorbed by the body, how the drugs take effect and how the drugs are processed and excreted by the body. In the past I thought being a doctor is hard, but the more I learn, the more I feel that being a doctor is an extremely formidable challenge. Whenever a patient comes in, you have to utilize all the knowledge you learnt in all 5 years in order to make an accurate diagnosis, what action should be taken to treat the condition and to make a good prognosis. 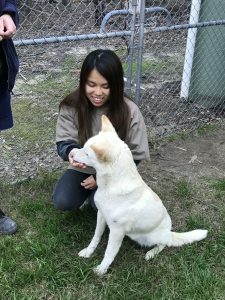 On the other hand, I planned to work as a volunteer for other clinics in the coming holidays since the clinic I have been working in only treats dogs and cats and the kinds of surgery available are often just neutering only. I want to explore more especially rabbits and orthopedics. This month I returned to school to have my summer semester to study biochemistry. The professor of this course has retired and he only teaches summer semesters. In my opinion he is the best professor in all the chemistry courses I have studied. He used simple ways to help us to memorize complex terms and reactions. And for other contents such as cycles and simpler reactions he helped us to understand them first so that we don’t have to memorize too many things. Also, he told us many useful knowledge such as vinegar is good for preventing gout and additives such as fructose and isomaltose will cause obesity. Moreover, eating fruits together with their skins is good for our health because it contains vitamin P.
I got very good results in the exams that I scored 95 and 98 in the midterm and final exam respectively, but what’s more is that I learnt much more than biochemistry in this course which makes me pay more attention to my diet in order to live a healthy life. Since volunteering in Eastern Europe last year, I became obsessed with working abroad. 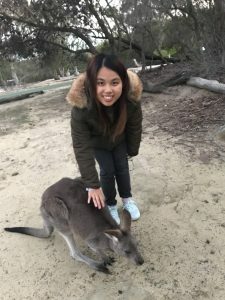 Therefore, I did not hesitate for a second when my Taiwanese friend in NTU invited me to join the Workawayer Programme in Australia half year ago. 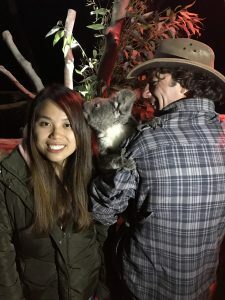 Australia wasn’t new to me, however, compared to the trip to Australia two years ago, which consisted of only traveling, this volunteering trip was much more special and meaningful. 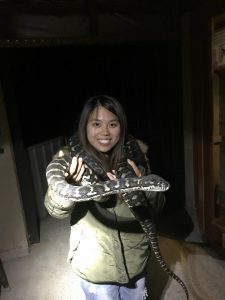 No doubt this was a fun experience, but the most unforgettable thing was the aim of the wildlife park. Normally, zoo is deemed as a commercial organization which breeds or buys animals to keep in the zoo for the visitors. However, it is completely different in the wildlife parks of Australia. In the park, animals are kept in the zoo only when they are saved from danger in the wild or have lost the ability to survive in the nature on their own. To be honest, I really appreciate such practice, since this not only can bring out the educational purpose for the public when they visit the animals in the park, but unnecessary hurt to animals are also avoided. This means that the park is saving animals while educating our next generations to love and care for lives at the same time. Isn’t it just like one stone killing two birds? Of course, all the above is just my personal thought only, and there may be lots of obstacles in practice. Finally, the working-away trip in Australia has come to an end. Despite the hard times in the trip, it was beyond question an unforgettable experience in a lifetime. Hope that I could have a real working holiday in the future!